The MBHU beam hanger provides a face-mounted solution for connecting beams to masonry or concrete walls. A non-welded, one-piece connector, the MBHU is suitable for solid sawn and engineered wood beams as well as trusses. Installation is simplified because the Titen HD® heavy-duty screw anchor and Strong-Drive® SDS Heavy-Duty Connector screws are included with the hanger. Since the Titen HD anchor is installed after the wall is built, locating the anchor in the right spot is easier than with cast-in-place bolts. Use all specified fasteners (included). – Drill holes using drill bits equal in diameter to the specified Titen HD anchor. – Holes shall be drilled 1/2" deeper than the specified Titen HD length (i.e. 5 1/2" for a 5"-long Titen HD anchor). – Caution: Oversized holes in the base material will reduce or eliminate the mechanical interlock of the threads with the base material and will reduce the anchor's load capacity. Titen HD is not recommended for exposed exterior applications. Provide moisture barrier between beam and wall per jurisdictional requirements. 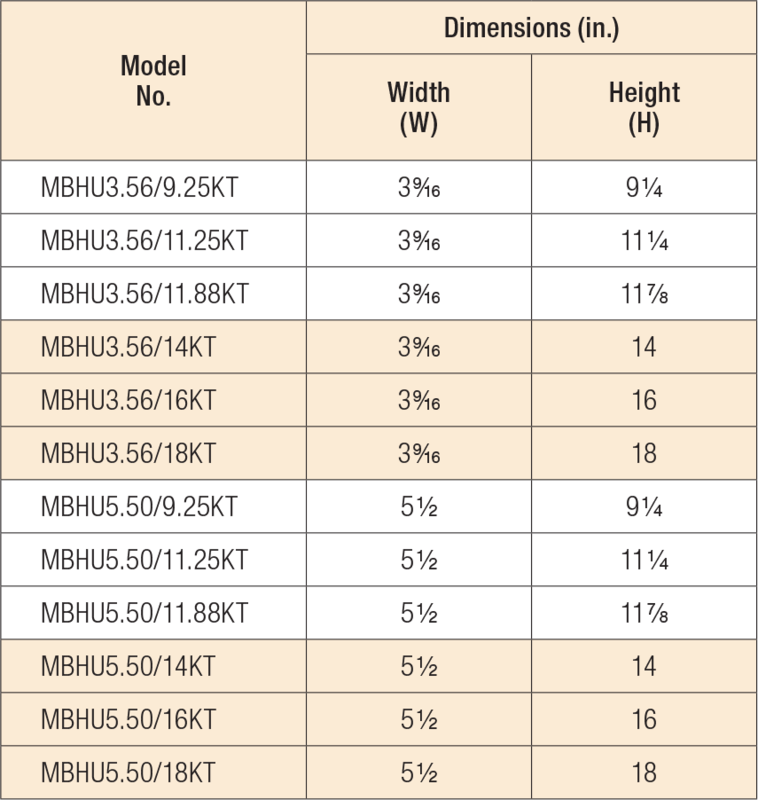 Each MBHU hanger includes (2) 3/4" x 5" Titen HD® anchors and (12) 1/4" x 2 1/2" Strong-Drive® SDS Heavy-Duty Connector screws. Structural composite lumber (SCL) shall have a minimum specific gravity of 0.5. Allowable loads only apply to installation on 8" nominal grouted CMU walls, with a minimum of one horizontal #5 rebar located in the top course. Products shall be installed such that Titen HD® anchors are not exposed to exterior environments. Allowable loads are based upon the tested ultimate load with a safety factor of 3. Where noted in table, loads listed are for end-of-wall condition. For outside-corner condition, uplift is 2,365 lb. and download is 3,640 lb. MBHU3.56 See specific model numbers for code listings. MBHU5.50 See specific model numbers for code listings.